Continuing on from Part 1: Evolution of a GoAnimate Contest Entry, I did transcribe my script from the video into written form. For script writing I use Celtix, the free script writing software just because it completely automates how the script is laid out and you can focus entirely on writing. I already mentioned that the idea for the script was inspired by Kevin Smith Podcasts so I named Friend 1 and Friend 2, Ralph and Kevin (after Ralph Garman - from HBO and, obviously Kevin after Kevin Smith). The script its self I transcribed word for word, then I wrote in two cut away scenes, the first of a Ninja actually killing someone and the second of a person photographing their lunch (with a visual gag happening in the background). I don't usually storyboard scenes for my own personal GoAnimations because there's no real need to do that if you're not showing the idea to someone else or, in this case, the majority of the animation is just two people talking with quick cut scenes. Since the cut scenes are the hardest part of the animation I went straight into the GoAnimate studio and started animating the two I'd written. 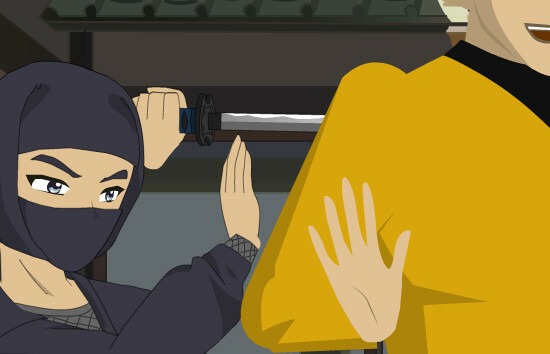 In particular the Ninja cut scene has to look good since the whole premise of the animation is about Ninjas. I always planned to use the newer GoAnimate themes for the cut scenes. As you can see in the thumbnail still image above I've use a Ninja Anime character along with one of the new Space Citizen theme characters. The photographing lunch scene uses regular Anime theme characters. For the two characters talking I decided to go with the Lil' Peepz theme since those characters are the most expressive thanks to the large number of action packs you can buy for regular poses and expressions. As you may have noticed from the Lil' Peepz image at the top of this article one of the characters is now my Lil' Peepz representation of me (and my dog, Oscar, is also in the scene). I figured since I'm voicing both characters, why not just have myself as one character? The other Lil' Peepz character looks suspiciously like Kevin Smith - or at least as close as I could get to him. Kevin is actually about the same age as me so in some parallel universe we could be friends (well I can dream). 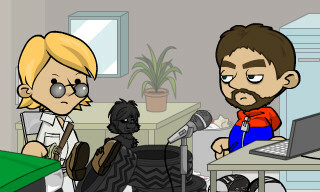 I was pretty happy with my cut scenes and character designs so next I moved on to recording the audio. For your interest I've put together a short video below to show you my audio setup and just how low tech it is. Record in a room with no echo. Generally this will be a room with no bare walls, lots of curtains, bookshelves etc. Anything that breaks up the surface of the walls. Carpet on the floor helps too. Use a microphone that at least has a sponge cover. This will also help to reduce noise and give you better sound. Recording with Audacity, the free sound recording and editing software is all you need. Use the 'Normalize' effect (default setting) to even out your sound and boost the volume. Export sounds in MP3 format rather than WAV as it will give you significantly smaller file sizes. I'm certainly not an actor but I do know when it comes to recording voices for animation it helps to exaggerate expressions and generally talk more expressively than you would in regular conversation. Also, speak up and form your words clearly. ...and that's where I'm up to. Next I plan to edit all the conversation scenes together. My tip for a editing conversation scenes in GoAnimate is to leave all the camera placements last. Focus on adding in all the audio and getting the expressions and character movements down, then go back through and frame each shot. I'm hoping to finish the animation some time towards the beginning of next week, hopefully before part 3 of this series so that in the next post I can talk about the finished animation. Thanks for the tip on Celtx. I am going to check it out, because I am working on something kind of big with multiple parts and I am going to actually write a script for it. Celtix is really worth getting. Not having to worry about formatting a script (or even constantly typing the name of the character speaking each time) really speeds up the work flow.